It's a very simple idea/screen, but very effective/useful. Works on any type of database (SQLServer, MySQL, Access). SQLServer/MySQL users: How often have you wanted to run a simple update statement (eg "update products set cprice=cprice*1.1") or a simple command to add a new column, and had to go to all the hassle of logging into your raw sql database to do it even though you're already in VPCart admin? Well, you no longer need to login to your raw database (or your host's web-based sql front-end if they have one) as you can execute your command directly from your VPCart admin area instead with this addon. 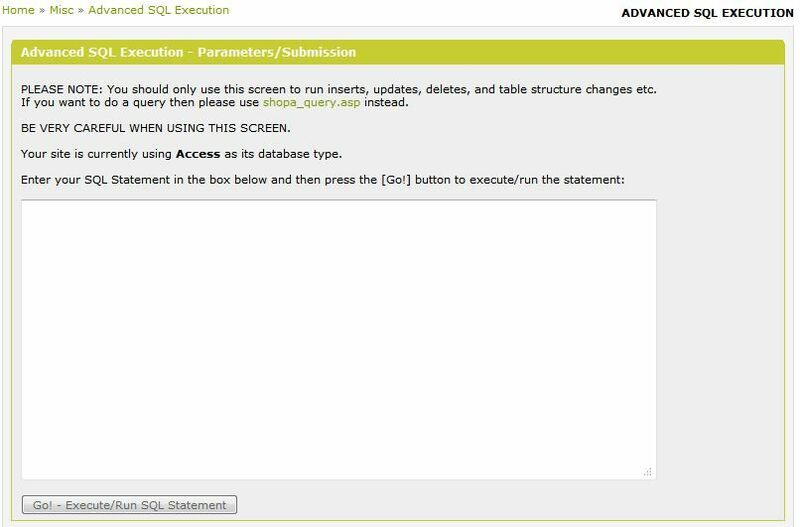 After submission, it shows you the SQL Statement that it tried to execute, and if your SQL Statement failed then it'll show you the failure message that SQL produced and let you try again. Access users: Same kind of benefits as SQLServer/MySQL users but with the added benefit that you don't need to bother downloading/re-uploading your access database file to perform your sql change. If you like this, have a look at our Bulk Product Update tool (BYZ089). 02 15-DEC-2009 Changed installation notes and program files to cater for VPASP V7 and tidied-up html etc. 03 12-OCT-2012 Added BYZ038 (V19). Enhanced to deal with special characters. Added a results block which shows success/failure of the execution and corresponding error message received if there was one (ie it no longer just fails to load the screen if the SQL statement fails, instead it shows you the failure message that the SQL generated and lets you try again). Made the textbox for the SQL statement bigger. 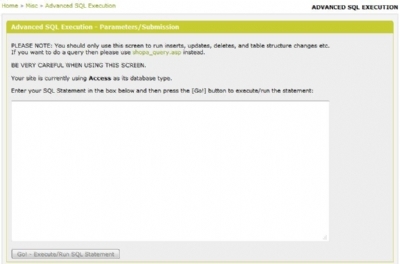 Added message explaining the current database type being used on the site (MySQL, Access, SQLServer). Changed to use BYZ038 functions where appropriate. Please Note: If upgrading from a previous version of BYZ097, you must make sure you are using V19 or above of BYZ038 before upgrading to BYZ097 V03 or above. Please Note: If upgrading from a previous version of BYZ097, you must make sure you are using V14 or above of BYZ036 before upgrading to BYZ097 V03 or above. 04 01-APR-2015 Upgraded BYZ038 (from V19 to V31).